This pastel is unashamedly in the style of Frida Kahlo. I did it back in 1995 for a ‘Fakes’ competition. It was runner up and featured in the ‘FAKES’ exhibition at the Raw Gallery in London. 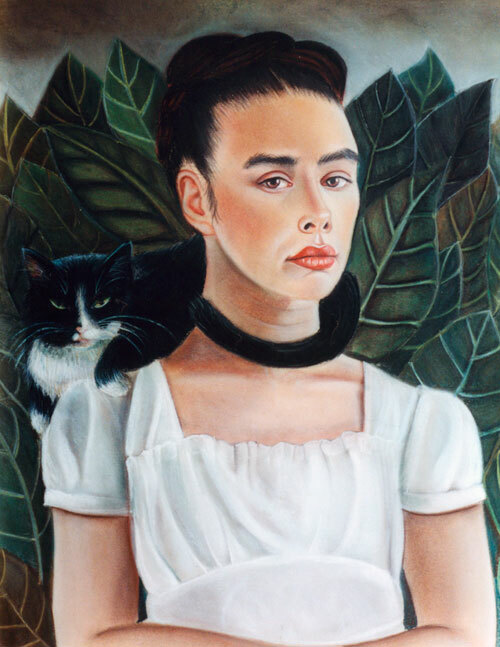 Frida Kahlo would often paint her pet monkeys on her shoulder with their arms around her neck. On my shoulder is Vasey. He was my beloved companion for 20 years. Here he has his tail wrapped around my neck too in a similar fashion.